Christopher's work amongst London magicians is known as much for the strong impression his magic makes on the audience as for his charming presentation style. Close-up magicians mix with your group, whether seated at tables or mingling with drinks, performing inches from your audience's eyes and often involving the audience directly as they help make the magic happen. 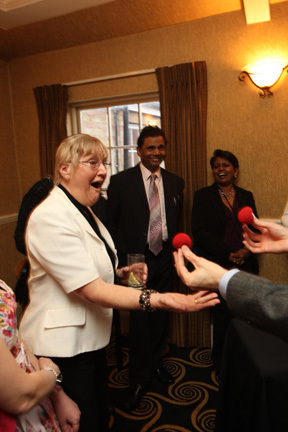 Frequently close-up magic is used as a warm-up during a reception to break the ice, culminating in an after-dinner magic show or an act by UK illusionists. Christopher performs with a variety of objects including cards and items borrowed from the audience. It’s flexi-time, depending on your needs, the number of guests, and the length of your event. "Christopher's magic was truly spell-binding; everyone at our launch party was mesmerised by his performances. I'd say he has to be seen to be believed, but I still can't believe what I've seen!" - Mr. A Quayle, Artistic Director, Box of Tricks Theatre Co.
"Aside from his amazing magic! Christopher was very friendly and a pleasure to communicate with. The positive reviews we read about him, prior to our event, were definitely true to form." "Christopher is a fantastic entertainer. We loved the way he mingled with the guests but was also very discreet and professional. His magic was amazing and was enjoyed by all. Initially I wasn’t sure whether having a magician would be ‘cheesy’ but Christopher's magic and performance style are pure class and very sophisticated and I would recommend anyone organizing a special event to have him perform. Absolutely brilliant."